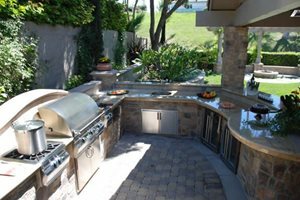 The cost of an outdoor kitchen will depend largely on its size, the materials you select and the appliances you want installed. 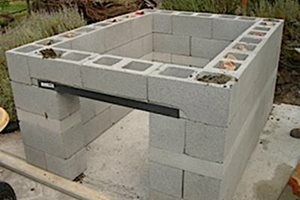 A basic outdoor cooking area with a patio, grill and countertop can run a few thousand dollars. While a luxury design with top-of-the-line appliances will cost many times that amount. AppliancesThe biggest ticket item in an outdoor kitchen is the grill. 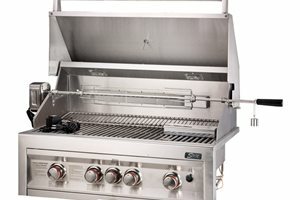 There are many manufacturers that offer grills at a variety of price points. Some drop-in grills are as affordable as eight hundred dollars, while others can cost more than ten thousand. 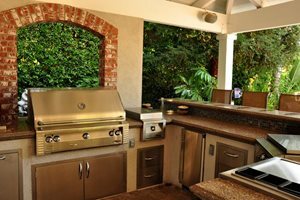 Communicate clearly to your designer or contractor how much you are willing to spend on the grill and what features you desire. Pro Tip: Don't spend your whole budget on the grill. A luxury grill surrounded by sub-par counters looks out of place. Pro Tip: If you are trying to keep the cost at a reasonable level forgo the sink, refrigerator and side burner. Instead locate the outdoor kitchen near your indoor one so that you can conveniently move between the two. You may even be able to use your kitchen window as a pass-through. If money is no obstacle there are a variety of upgrades you can make to an outdoor kitchen. First, you can upgrade the materials. Instead of a stucco base, opt for a natural stone veneer. Instead of ceramic tile counters, opt for granite. Second you can upgrade the appliances. Brands such as Kalamazoo Outdoor Gourmet and Viking offer premium outdoor grills and accessories. You may also want to consider including warming drawers, a deep fryer or other unique appliances. Third, you can add features that will turn your kitchen into entertaining central. Try an outdoor television with surround sound. Pro Tip: Outdoor refrigeration appliances such as wine chillers and keg dispensers have ongoing costs to keep them cold and functioning properly. Another option is to install a beverage center that can be filled with ice to keep drinks cool during a party. Most outdoor kitchens fall into two categories that have a big influence on cost. Understanding the differences can be helpful in early decision making due to the links between location and cost. Keep in mind the costs can be generated by invisible factors such as utilities, which are closely tied to the features designed into the layout. Outdoor kitchen expert Dawn Whyte of Lake Street Design Studio in Michigan prefers to divide all kitchens into two location based categories. "A perimeter kitchen is right outside house, maybe sharing wall, overhang or patio cover. Here you need a grill, perhaps a refrigerator, but due to proximity of the indoor kitchen you may not need a sink. However, because you're so close to the house you can add sink later on because the house utilities are right there." Pro Tip: Running utilities for an outdoor kitchen can be expensive. Try locating it near your home where water and electric are already available. "A satellite kitchen is out in the landscape, separated from the house so it must be as self sufficient as possible. For satellite kitchens, all utilities must be run at significant cost. Then you need sewer hook up or a daylight drain depending on the local codes. Here design is more important because you need to cover all the details in the same depth as we do indoor kitchens to make sure it works for the client." 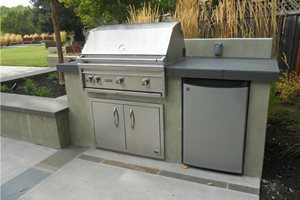 What makes an outdoor kitchen so challenging to estimate is that every one is a unique creation. The constellation of elements within the kitchen as well as costs related to overhead structures and paving is highly variable. A primary division of costing out such a project is whether the kitchen will be composed of all new custom built structures or those modular prefabricated "frames" that are finished on site with more decorative surfacing and details. This is why it's difficult to set an overall cost. Perhaps more important to the overall cost is the utility requirements. For example, an outdoor sink requires a hot water hook up and drain to the sewer system. Items such as a refrigerator requires 110 volt electrical lines in conduit. The grill may require natural gas piping. These are the sometimes hefty costs that cover the invisible infrastructure. 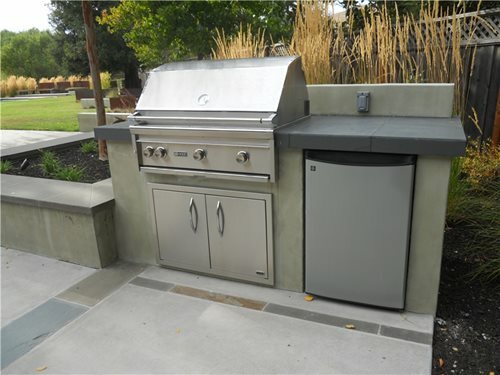 Providing utility stub-outs is far easier on a new home outdoor kitchen than it does a remodel where existing structures may require alteration to provide access. When you use prefabricated outdoor kitchen frames, these average about $200 per linear foot for the raw frame itself. This frame will hold all your appliances and it must be finished on site. This finish is a veneer that integrates it with existing architectural materials or those proposed for a new landscape. The costs detailed below are rough estimates that may vary by region and contractor, but they provide a relative basis for choosing an affordable veneer. The costs below are all rated on a surface square foot basis. Stucco: $5.00 per sq. ft. Manufactured stone: $20.00 per sq. ft. Brick veneer: $15 to $25 per sq. ft.
Standard brick: $25 to $35 per sq. ft.
Natural stone: $25 to $45 per sq. ft.
Bluestone countertop: $35 to $40 per sq. ft. Granite countertop: $60 to $70 per sq. ft. Poured concrete countertop: $60 to $70 per sq. ft.